There is a secret shining jewel of a flying site hidden on our northwest peninsula. As much as I love to fly Dillingham, I am even more enthralled with the other side of that beautiful point! We don’t have a good name for the site yet. Southwest Kaena? The End of the World? The speed flyers pioneered it but we are finding out that it works well for us too. When I say it works well, I should point out that it's our most daunting mission: an hour and a half of driving, followed by forty five minutes of hiking, and then a very tricky crosswind shelf of a launch that requires crack ground handling skills, if the airflow is even working right. It’s not for everyone. But if it’s for you, you need to check it out. 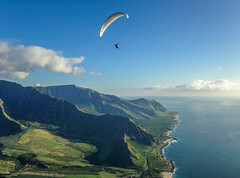 Today, four of us checked it out in the most ideal light southwest flow, launching from the point, and then soaring in smooth and stable conditions across Yokohama Bay, and Makua Valley, to reach Ohikilolo Valley, on the south face of the Makua ridge. There we found some of the same stable broken thermals we’d encountered at Nanakuli the day before, and we battled our way up, trying to get high enough for the return trip. We made our way back and then soared all over Yokohama Bay until the sun was sinking into the ocean below, four hours after we launched. That was one of the sweetest and prettiest flying days I can remember in a long time. Jorge said it ranked among the top 1 flights he's had here. Now that's a rare flight! Roll call: Allegra, Flystrong Bill, Jorge, me. Dang w***, I want to go! But then I can't conjure my wing up like that. And an hour and a half of driving seems so far, but I'm sure the views were fabulous, and a refreshing new perspective of the giant blue meadow we're floating in. I NEED to check it out, if even just for the exercise. Way to go Allegra, Bill, Jorge and Alex! Ok just kill me now. The only thing I hate more than the left lane drivers in this state is missing a flight like this. Glad some one was there looking forward to all the pics and a full debrief someday. Argh. Congrats, almost wish JJJ would stop bitching because now I had to read this one. I just bit my lip on my coffee cup too. Josh taugh me that often the stable difficult conditions near the coast will mellow and imporve as you move inland. If you can gain enought altitude to explore inland you may be rewarded with higher and further. I havn't seen the sun in 5 days :(...nice flights. I've been enthralled with that site for some time. In fact, there may still be an unfinished story of mine sitting idle in blogger as a draft, waiting for a flight to validate the dream. Such an incredibly shaped bowl behind Yokohama, treeless, scooped out, and sloped to perfection, but facing in a direction that so seldom allows it to produce the magical lift that it must have been created for. I am thrilled that further validation has come. Now if those ominous golf balls weren't looming on the ridge. Like the Class D at Haiku, where man-made obstacles impose upon nature's perfection, we are occasionally compelled to take divine exception and fly on. JK, I'm sure you're joking about class D. As pilots we don't get divine exception. Except on Sundays when the airspace isn't active! I guess we can thank God for that little blessing! Otherwise we must rely on nature's perfection, i.e. cloud base, to allow us safe and legal passage. It's really not that hard to stay above 2,500 on any decent XC day. As an airline pilot, I rely on you to help me educate the rest of us regarding airspace issues. Regarding the radomes at Kaena: I've read that safe distances for uncontrolled exposure are in the range of 2,500-3,000 feet to the sides and above. But we are okay below them. So far, in our handful of flying days out there, we've done pretty well staying below and away from the radomes. We launch at about 200 feet ASL at the point, skim the long wall below the radome on the ridge line to the corner of Yokohama, work our way up at the corner, and then take a wide line around the next set of radomes to reach the far side of Yokohama. I read that the danger is a narrow pencil size beam that could heat up a slow moving piece of meat with microwave radiation. Of course in my mind I picture a pod being cut off with cauterized leg stumps exposed. Really bad for your glide performance. In any case it's definitely worth keeping our distance. And again, not hard to do on any day that's good for flying out there.